A third of all UK TV shows watched by kids have references to smoking or tobacco, scientists claim. This is despite advertising and broadcasting regulations designed to protect children from this kind of exposure. Its use is widespread during peak viewing – and is likely to influence young people to take up the habit, say scientists. A study of the five national free-to-air stations found it occurred in one in three prime time programmes – and nearly one-in-ten (8%) adverts or trailers. Channel 5 was the biggest offender. The study published in Tobacco Control found the amount of tobacco content has hardly changed in five years – including before the watershed. For instance it is seen in about a third of soap operas, chat shows and news and current affairs programmes, around four-in-ten documentaries and drams, half of comedies and two-in-three cartoons – mainly The Simpsons. Dr Alex Barker, of the UK Centre for Tobacco and Alcohol Studies at Nottingham University, said four to 15 year-olds watch most TV either in the morning or early evening from 7 to 9pm. He said: “There is a causal link between viewing tobacco content and subsequent use. The OfCom 21:00 watershed is currently not fulfilling its purpose. “This study demonstrates tobacco content – including smoking – occurs frequently on UK prime-time TV in programmes which are likely to be viewed by young people. This is likely to lead to experimentation and uptake among young children. Research has shown teenagers are much more likely to take up smoking as a ‘cool’ habit if they see actors smoking on screen. Epidemiologist Dr Barker and colleagues said smoking in films has been investigated extensively. But relatively little attention has been paid to its inclusion on TV shows, even though children are likely to spend more time watching these than movies. Dr Barker said: “Smoking uptake is a major threat to the health of children. “Most adult smokers become regular smokers during childhood or adolescence and those who continue to smoke sustain a loss of one day of life for every four days of smoking after the age of around 35. He said about 28 million British homes have at least one TV and average viewing last year was 3 hours, 23 min per person per day. His team analysed the tobacco content of all programmes, adverts and trailers on BBC1, BBC2, ITV1, Channel 4 and Channel 5 between 6 and 10pm in three separate weeks in September, October, and November 2015. This included actual and implied use – such as holding a cigarette, making a comment about smoking, seeing tobacco paraphernalia and presence of branding. The study of 420 hours of footage included 611 programmes, 909 adverts and 211 trailers. Overall 291 broadcasts – 17 percent of all programmes – featured tobacco. The channel with the most content was Channel 5. BBC2 had the least. Actual smoking occurred in one in eight (12%) programmes, mainly cigarettes (79%) followed by pipes, cigars and e-cigarettes. ‘No smoking’ signs were used in just two percent of broadcasts. Although most smoking occurred after the 9 pm watershed it still appeared before then. 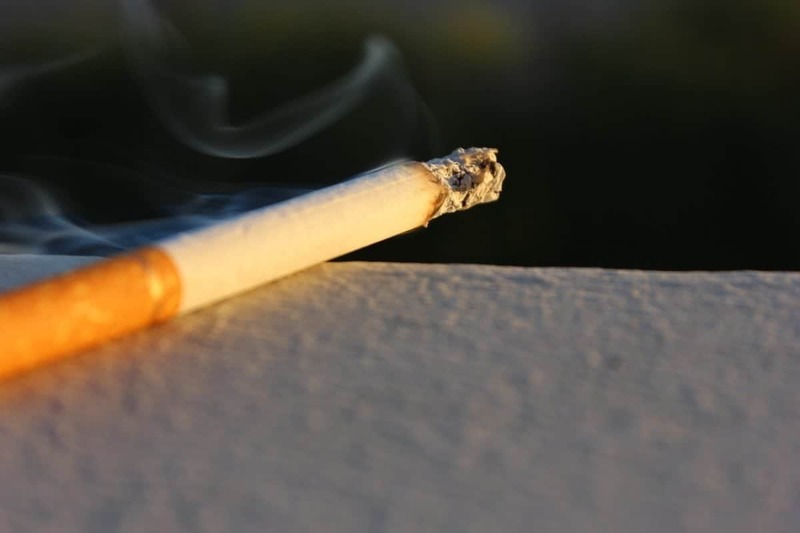 Comparing the findings with a similar study by the same team in 2010 showed the number of 1 minute intervals containing tobacco actually increased – from 731 to 751. Dr Barker said: “These findings are virtually unchanged from our earlier analysis of programme content from 2010. Tobacco advertising, promotion and sponsorship – including paid product placement in TV commercials – is banned in the UK. But tobacco imagery in programmes and trailers is exempt – and covered instead by media regulator OfCom’s broadcasting code. This code is designed to protect children by restricting depictions of tobacco use in children’s programmes and preventing the glamorisation of smoking in programmes broadcast before 9 pm. His findings follow a study earlier this year that showed about eight-in-ten shows popular among teens and young adults depict tobacco use. Researchers found cigarette use is more prominent in Netflix shows – like Stranger Things, which had 182 scenes featuring characters lighting up. They said TV has glamourised smoking in the same way tobacco ads did despite the global push to make young people aware of cigarettes’ links to cancer. Winona Ryder who stars in Stranger Things frequently lights up on screen. The show drew an estimated 15.8 million viewers within three days of its second-season launch. Orange is The New Black came second for having the most number of scenes with tobacco use. House of Cards starring Kevin Spacey was next. Research published by the US Centres of Disease Control and Prevention in 2017 found teens are two to three times more likely to start smoking if they see people on screen lighting up. These results are echoed in the preliminary surveys of broadcast, cable and streamed programs in the USA. With video streaming services expanding rapidly internationally, nations need to take steps to safeguard populations against the “cross-border” tobacco promotions in entertainment media that the World Health Organization has repeatedly warned against — and which Framework Convention on Tobacco Control (FCTC) signatories including the UK have obligated themselves to combat. Big Tobacco has seldom hesitated to buy its way onto screens of ANY size. For a quick intro to FCTC Article 13 policy steps, visit: https://smokefreemovies.ucsf.edu/research/key-reports/world-health-organization.